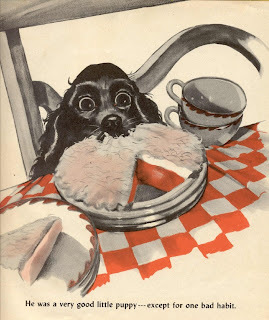 I'll give the cats a break today and show you this cute dog story by Nancy Raymond; pictures by Dirk. It was published by The Fideler Company in 1945. It almost looks like it should be a Fuzzy Wuzzy book because the illustrations are so lush and velvety. I think they were done with charcoal. Lots of nice rich reds and blacks. This copy is nearly disbound, spineless and water-damaged, but thankfully the text pages escaped damage. "Once there was a little puppy with big, floppy ears and soft, silky fur. He lived in his own house under the big maple tree. He was a very good puppy except for one bad habit...he wanted everything he saw, and he grabbed everything he wanted. That is why he was called Grabby." "At night, before he went to bed, he grabbed Larry's slipper. 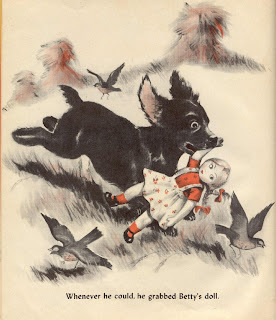 Whenever he could, he grabbed Betty's doll." "He often growled boldly and grabbed the bones from the pups who lived in the apple orchard. When Spotty kitten was playing with the yarn balls, Grabby took them both. 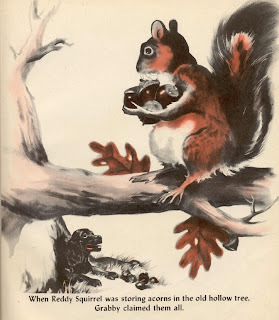 When Reddy Squirrel was storing acorns in the old hollow tree, Grabby claimed them all." 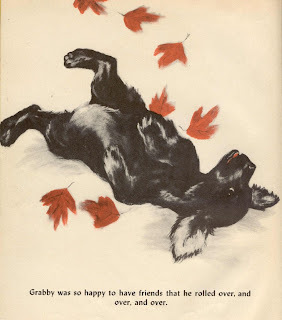 "By the time the leaves began to fall, Grabby didn't have a single friend. Spotty Kitten would jump to the top of the milk can when Grabby came near. Reddy Squirrel would chatter sharply at Grabby. 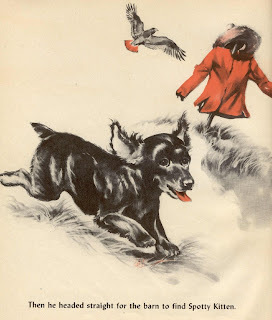 And the pups in the apple orchard would run away with their bones whenever they saw Grabby." "But mother knew what the trouble was. Said she, "You must be taught a lesson, my little Grabby Pup." So that night she kept Grabby up until very late, making him walk 'round and 'round without grabbing a single thing. Next morning, Grabby was up bright and early to eat his bowl of puppy meal. 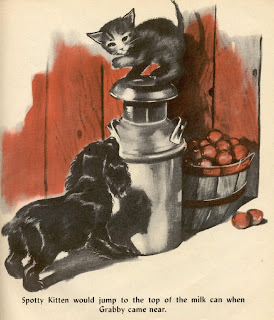 Then he headed straight for the barn to find Spotty Kitten." "He watched Spotty politely, and not once did he grab her yarn ball. Then he set out to see Reddy Squirrel, frightening Old Gander as he ran. When Grabby reached Reddy Squirrel's hollow tree, he didn't touch a single acorn. Reddy was too surprised even to chatter. When he didn't grab their bones, the pups couldn't believe their eyes. So the next day they all had a game of Tag Tail, and Grabby was the leader. Grabby was so happy to have friends that he rolled over, and over, and over. Said Mother, "You are no longer a Grabby Pup."" I also have a copy of this book but the cover is more of a brown color is it older or newer than the you have posted here thank you James R.
Thank you! 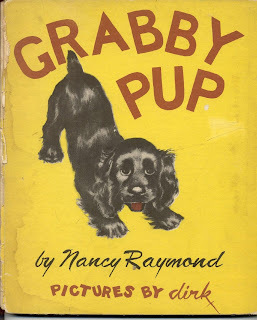 "Grabby pup" was a well-used phrase around our house when I was growing up. I don't remember the book, but it must have come from there.